Tomas Maunier is a Brazilian brought up in Argentina and now living in Leeds. He originally relocated to the UK with his wife who was studying for a master’s degree in Bradford and Tomas now heads up the Fazenda group, a Rodizio Bar and Grill with continuous tableside service from traditional Passadores. Fazenda now has restaurants in Liverpool, Manchester and Leeds and with plans to expand further into the North of England it seems the UK’s passion for meat is unstoppable. In light of this we just had to have a one-to-one with Tomas. What makes him tick? And is Argentinian beef really the best? You’re clearly a busy chap, what with three restaurants up and running and several more in the pipeline, how do you achieve a work-life balance? Life? What’s that? The jump from one to three restaurants is big. The jump from three to five is different. It’s hard work and we are concentrating on building infrastructure around the business. Our team is very important to us. Fazenda is a carnivore’s paradise with an extensive selection of authentic Argentinian cuts of meat. Where do you source your produce from and what would you say to all the vegetarians out there? We get through four tons of meat every month between venues. Only foreign suppliers can support this volume. Our meat is always tested first as the product needs to be consistent. After many blind tastings we have found that local suppliers cannot offer the level of consistency we are after therefore we source from Argentinean suppliers. I would say our salad bar is not your average offering and all of the vegetables are sourced locally. There is a very good selection for non-meat-eaters and our menu does have vegetarian and vegan options. Fazenda Manchester is inspired by the top-end restaurants in Sao Paolo. 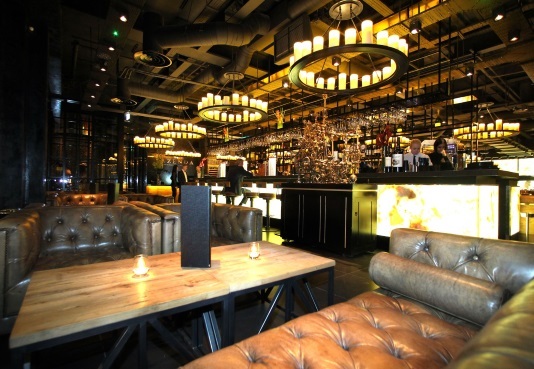 Manchester-based Carroll Design are specialists in interior design for restaurants and they created the space. All of the Fazenda venues have their own identity and are all individually designed and we want to keep that going as we open more. What sets your restaurant apart from your competitors? Passion! We really care about and instill passion in our staff. A little birdie told us you’re now looking to open a Fazenda in London. Is this true and where would your ideal location be? London is just one of the options on the table. Nothing has been signed yet. Birmingham and Edinburgh are most likely. We just had to ask Tomas…Can you Tango? No definitely not! But I do like the music. You’d have very sore feet if you danced with me. What motivates your involvement with Action Against Hunger? Where I come from I see poverty everywhere and I’m blessed in comparison. Hence the motivation for getting involved. I am a Brazilian brought up in Argentina. I want to give something back by getting involved with charities who will directly help the disadvantaged in Argentina and Brazil. With so many great restaurants now in Manchester and Leeds, where do you enjoy eating out? My house and my wife’s cooking! It’s tough since I have been researching so many restaurants. Where I come from, friends’ houses are where we go to relax and eat. So for me the best meal is at a friend’s; it’s not the food but the people around you. And last but not least (we couldn’t resist) Maradona OR Pele? Messi! I met Maradona a couple of times and he is a very funny and bright person. Pele is a bit fake.